Wendy Red Star (Apsáalooke/Crow) "Spring" From the series "Four Seasons"
The Nevada Museum of Art currently shows a museum wide exhibit called Unsettled, an amazing array of art work from regions they define as The Greater West. Both terms are charged and intentionally pose more questions than they resolve… Unsettled implies many things including disturbance, unpaid, uninhabited, doubtful and mental, emotional or geological instability. When attached to the newly formed term, The Greater West, all forms of unsettled can be applied. What exactly is The Greater West? I have circled around this term for 2 weeks now. America was founded on the premise that this was a great uninhabited land mass full of resources, “the land of take what you want” (Enid Blyton) involving a massive Empire ego and the idea that the colonizer was a superior race. “Empty” lands were fair game and their resources and native peoples could be conquered and converted, expanding the Empire and claiming the resources. On entering the main body of the exhibition an overwhelming and delicious mixture of spice smells intermingle and waft through the air as ceramic plate after plate of piled up spices in intense colours come into view, this is the work of Sonia Falcone, Campo di Color points at the abundant resources that have been harvested and exported by the colonizers. As you begin to take in the enormous show there is a third way of defining The Greater West. The regions which in the 20th Century and 21st Century the American nation has protected or commanded through its massive nuclear firepower capabilities and areas still considered unsettled that have been used as test sites. Nevada, Australian Central Desert, Marshall Islands, Bikini Atoll etc. As a New Zealander I find being assimilated into the Borg of The Greater West problematic, not to mention there seemed to be no representation of works from New Zealand, Australia, nor the Pacific Islands. But then rebuilding our understanding of boundaries is a strange and interesting brain exercise just as strange as our town Wizard, in Christchurch, pronouncing that the world was round, we were standing upright and were therefore on the top. He rebuilt the map of the world with New Zealand at the top, most Northern country and pronounced us top of the world and therefore better than everyone else…. The Wizard’s reasoning always gave me a revised perspective of whose history we are reading and which maps we still use to navigate the world today. Having said that, let’s just say the actual objects in the show are mainly concerned with the continental Americas, America and its territories, conquered, bought or walled off from attached countries. After redefining the concentration of the show, it is possible to listen to the voices that are represented here and gain some understanding of lives and responses to the world through art. The show at first seems difficult to navigate, as it contains a huge variety of work from unknown artists, dead artists, 19th and 20th Century and contemporary living working artists. On 4th visit and having attended the Art + Environment conference 2017 it begins to make more sense. It is a celebration of the differences between us all that make life and culture interesting. The show is full of responses to the west today from Thlingit, American Indian, Mexican and many other diverse artists, alongside white American artists responding and bearing witness to the land and life in this region. Unsettled is beautifully and compassionately researched, curated by JoAnne Northrup, and co curated by Ed Ruscha. Ruscha uses his own work as a framework for nearly every section of the show, which raised my eyebrow, but provided experiences such as the Chocolate Room, (cacao screen printed panels lining a room, wafting chocolate through the air), and his version of the tensions implicit in The Greater West. However, this did make me wonder what the exhibition might have looked like if the co-curator was indigenous to The Greater West. Regardless, I found the works of the indigenous artists most interesting throughout the museum. The contemporary works of today’s indigenous artists are less passive, perhaps less coded, and more aggressive than in earlier times. The works reinforce the idea of cultural collision, they are poignant and pointed. They leave an imprint. Thlingit artist Nicholas Galanin photographed road signs that show how ridiculous our presumptions have been… “Your inane Perspective” 2015 shows a huge green sign saying, “No Name Creek” with a very small sign with a very long native name for the creek below. His photograph “Get Comfortable” shows a road sign saying Indian River, River is crossed out and is replaced by the spray-painted graffiti word Land. Discomfort and implication seeps out of every part of these photographs. Wendy Red Star’s photographic idyllic dioramas of stereotypical little Indian girl in nature recreations instantly attracted my attention. From a distance, they look like sweet reminiscences to be opened and on closer inspection the diorama and bucolic scene falls apart as a cheap fantasy. The animals are blow up, made of plastic, the scene behind is a folded poster, throw away culture masquerading as idealized paradise. The series of works by Mexican artist Ana Mendieta, show body impressions etched or dug deep into the earth and rock asserting her connection to the land, while in Desierto Guatemalen artist Regina José Galindo shows photographs and video of herself buried in a room of what appears to be golden desert sand. The Desert sand is in fact sawdust, speaking of the monocultures of non-native trees inserted into the land by the timber industry. Galindo exists in the room buried alive with only her head exposed, while visitors view her from behind a glass window, like a live natural history museum exhibit. Ana Teresa Fernàndez is a Mexican American, her work Erasing the Border” is a timelapse video of a woman in a short black evening dress and high heels climbing up a ladder many times with a paintbrush as she paints out the border wall between America and Mexico in a pale blue so from a distance it becomes invisible. Connected to this work are a series she showed at the Art + Environment conference, of families that had been separated by the building of this wall having picnics at the beach, reaching through the giant girders to share food together. More heart-breaking images of separation followed when she discussed that during the Obama presidency, the wall had been heavily reinforced and only a tiny pinky finger could be inserted through to the other side to touch relatives and loved ones. 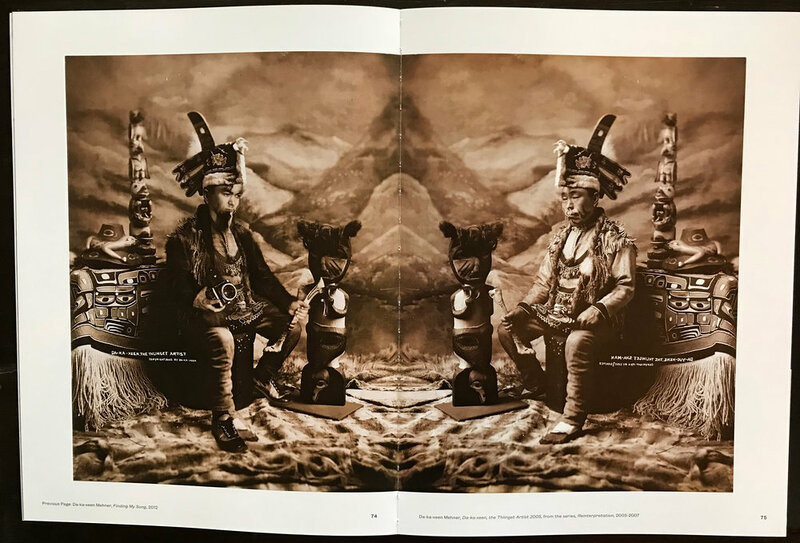 Da-Ka-Sheen Mehner inserts himself in (viewing the exotic) found studio photographs of Thlingit Shaman and other Thlingit important entities. He mirrors the original photograph with himself as Shaman or chief and carries the objects of his own life, work and identity, such as the camera, jeans and sneakers. Da-Ka-Sheen Mehner "Finding My Song"
The absolute highlight of the entire show and Art + Environment conference was the performance artist Alison Warden AKA Aku-Matu. As she began to speak at the conference her voice sounded like the familiar and gentle voice of a grandmother, friendly, beloved, calming and hypnotic, telling her story. Further on Warden changes persona and relates the story of her mother’s life (one of the stolen generation forced to become whitewashed) in jarring, half wild emotional rap. 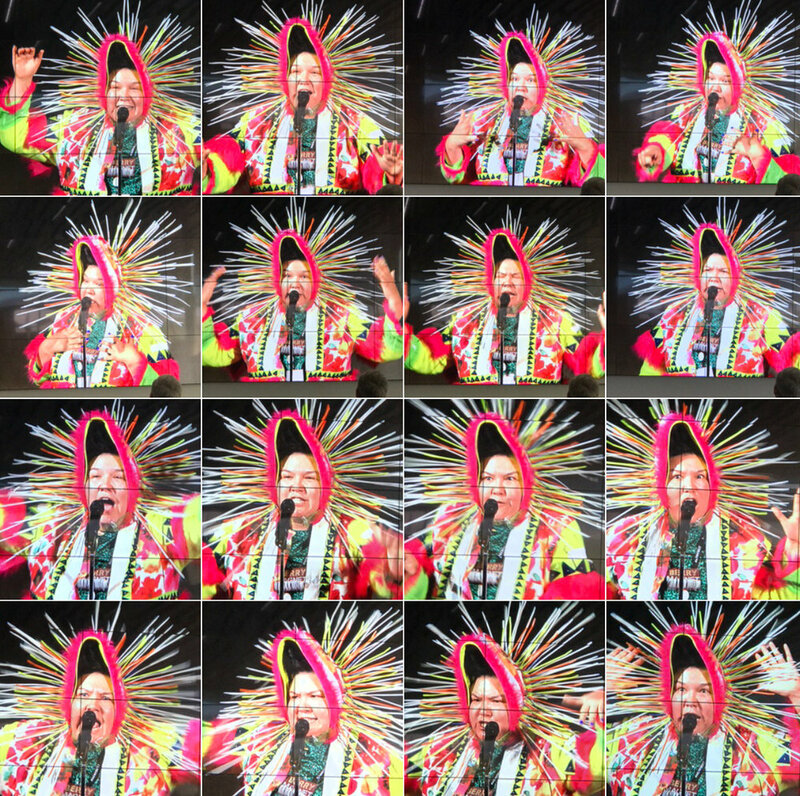 The performance was startling disturbing and left nerves jangling, only to be followed by a third persona wearing a giant Alaskan style coat in loud searing colours with a head dress of plastic like a corona or the surrounding halo of an icon. This performance was even more astounding as she rebuilt new dulcet comforting tones and began to sing/speak “I am your ancestor from the future” looking every bit a futuristic but traditional entity whose voice and face poured out love and sweetness. The sound and words were mesmerizing and at the conclusion the audience was entirely entranced with her. The bravery, community spirit and depth of Alison/Aku-Matu’s work has stayed with me and I know with many other attendees. After experiencing Aku-Matu’s performances it was difficult to see many of the white American male artists work as much more than chest thumping or pointing at exercises in futility. Paul Kos Roping Boars Tusk 1971 is a video of an inexpert cowboy trying to lasso an eroded mountain in the distance. The western idealized version of Cowboyness, trying to dominate a Wild Western landscape. The Mark Klett photograph Bullet Riddled Saguara Near Fountain Hills, Az, 1982 shows the wanton destruction of a giant cactus surviving the extreme and arid environment, only to be shot to pieces, for fun, by new inhabitants of the Wild West. Similarly Francis Alÿs records himself tracking and catching up with tornadoes only to be engulfed within a tornado, which is unstoppable and leaves him probably with a wastefully destroyed video camera and continues on its way across the dust belt farmland ripping up ploughed soil and taking it far. Miss Atomic Bomb 1957 photograph by Don English sums up the super power mentality, the facile idiotic nature of popular culture and the absolute insanity that nuclear power and incredibly little comprehension of its monstrous destruction and mutilation of human bodies and existence, which had recently occurred at Hiroshima. The very real horror was played out in the assembled and remastered film footage, by Bruce Connor, of nuclear tests in the Bikini Islands in 1946. The footage reveals the giant mushroom cloud ascending and its following waves of effects engulf and miniaturizing huge warships, and finally the cameramen themselves. On leaving the exhibition and the Art + Environment Conference I examined the shakey Western premise of possession and ownership, the conditioned notion of superiority and how it is all coming unraveled as history is rewritten to include those who were already living in the unsettled Greater West. Words relating to the queasy feeling in my stomach were transience, impermanence, shifting ground, shared time, temporary and disquiet. This uneasiness of being is reinforced by the ever-increasing spiral of questions arising out of this show Unsettled. I consider this an exhibition and Art + Environment conference that has achieved its goal… to disturb the equilibrium, unbalance, destabilize conditioned thought processes and unsettle the settled.